This morning I was stuck. WordPress was not working properly for me and even though I kept deleting and starting over, my photographs would not go up in the order I wished. After trying a few times, I got irritated and then I thought, Right, I’ll just put them up in reverse if they won’t load the normal way! What you see below is what I wanted in the beginning. It did require thinking about it differently and going at it from another direction which is interesting if you consider the images and subject for this post. 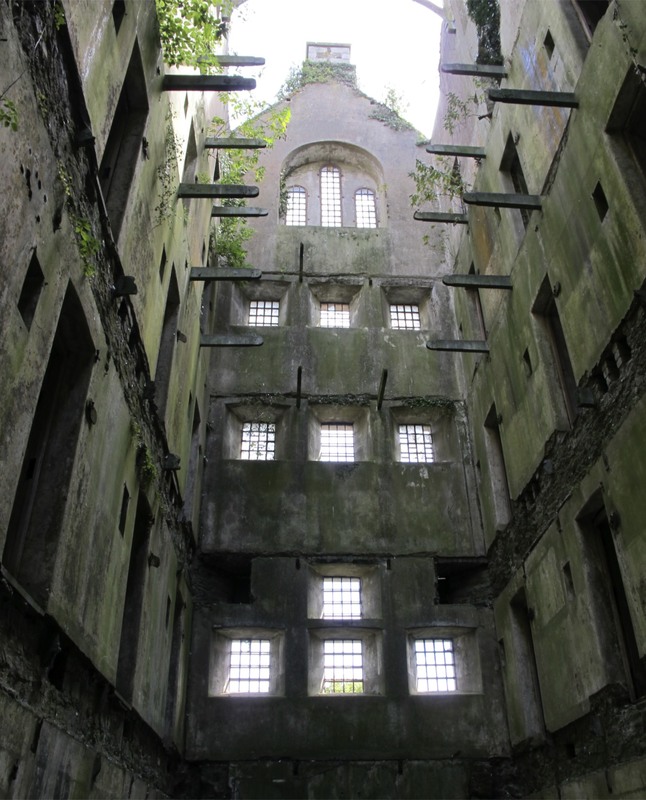 Bodmin Jail, also known as Bodmin Prison, probably didn’t allow much deviation from their standard way of doing things. Rules were necessary to maintain order and it was funny that today’s post would not behave properly. 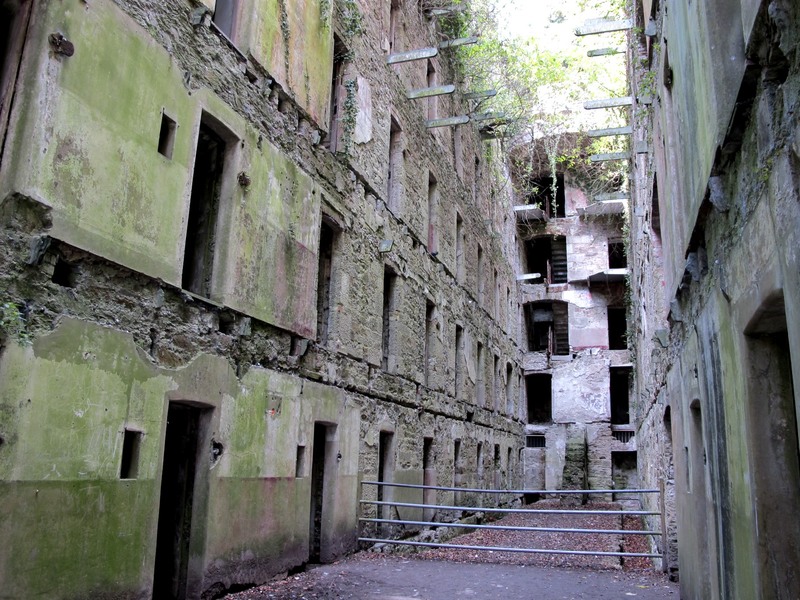 Bodmin Jail is a collection of old buildings that are mostly falling apart. A few have been restored and you can have a meal in the restaurant or stay overnight as part of a ghostly evening, but most of the buildings are not in use. Unlike historical ruins in America, walking and exploring are permitted and John and I stepped through an old main door and into a former cell without any problem. 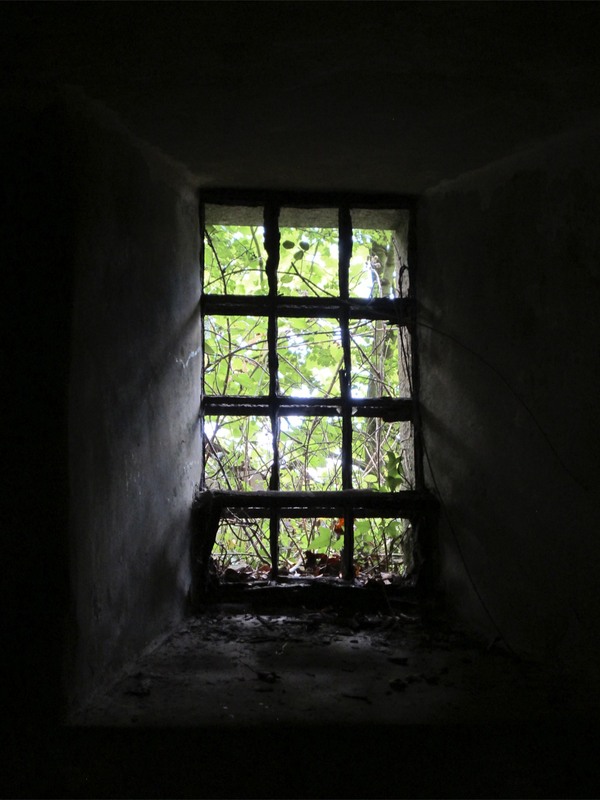 Standing in a cell built for one, I wondered what prisoners thought when they stared out through the windows. 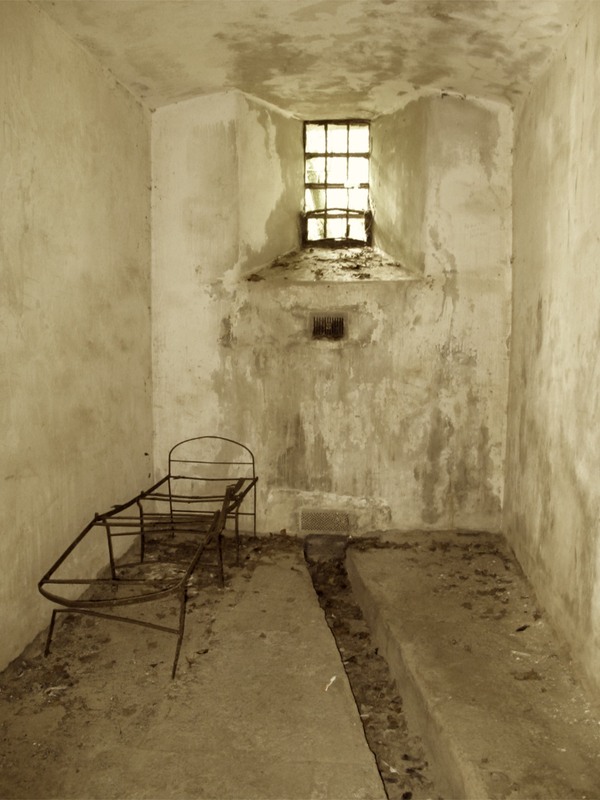 I found it scary and confining as you might expect a prison would be especially one with such history. 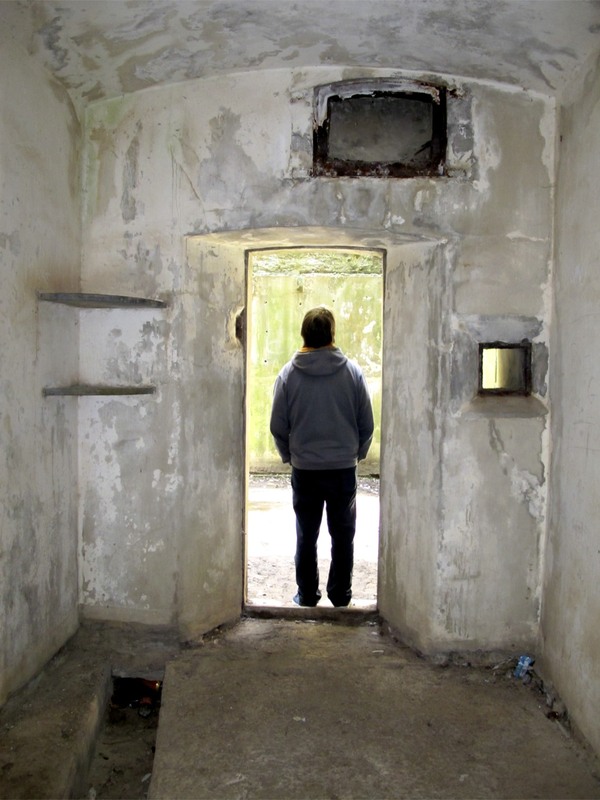 Bodmin prison was the first British prison to have individual cells and I wonder if that was better or worse than sharing with another person. They were keen on punishing with silence and isolation and I was surprised to see they had windows. I wondered if prison officials thought that watching others walking free might increase the pain of incarceration. You can get an idea of the size of the space in the cell by the photo above. John had just stepped out and I was shooting from very near the window. I looked online trying to discover what the long narrow trough was used for. John suggested it might be for waste disposal since there was no indoor plumbing. As Bodmin Prison was built in 1779 I’m not surprised by the lack of facilities, but it is odd that I could not find anything to tell me why the trough was there. There’s a good bit of info on this site, but be prepared to have to decipher a bit as John and I both agree that it could use some editing. This same shot appears on the website I mentioned above and I took it in one of the first cells you see once you are inside the main hall. I can only assume that the photographer was as nervous as I was about being in a place where people were once publicly hanged for their crimes and like me, did not feel like photographing the other cells. I did poke my nose in a few others, but I was moving fairly quickly. This was just one building that housed prisoners. I can’t imagine the despair at being sentenced to serve time here especially when you read about how minor some of the crimes were. There was no one about guarding the area and one could easily climb around if feeling brave. John never seems to need as long to absorb the details when we see new places and I’m not usually bothered about lingering behind to snap a few more photos before hurrying to catch up with him, but on this trip when I heard him say he’d had enough and was going on, I decided I’d seen enough too and left with him. This entry was posted in Choices, Cornwall, Living in UK, Photography, Travel and tagged Bodmin, Bodmin Jail, British Prisons, Cornwall, Elizabeth Harper, Gifts Of The Journey, Going To Jail, Hangings, Public Executions. Bookmark the permalink. Like a travesty of Fountains Abbey, isn’t it? Good post. Oooh, not been there, next time I’m in the area I may check in, I mean check it out. There’s something so very sad about this series of images..and the story they tell. After all – in the end – they were ‘people’ who were imprisoned there..no matter how criminal or insane. Nice photo-essay!